In a previous blog post, the Civic Federation explored the Illinois State Actuary’s findings in its first statutorily required report on the Chicago Teachers’ Pension Fund (CTPF). In this follow-up post, the Federation examines the impact changes to actuarial assumptions recommended by the State Actuary had on the CTPF’s funded status and the State Actuary’s analysis of funding adequacy. The CTPF, following a pattern of public pension funds across the United States and following the recommendations of its actuary and the State Actuary, voted in 2017 to lower its expected rate of return on investment by half a percentage point to 7.25% from the previous rate of 7.75%. The fund also made related changes to inflation and salary assumptions. The rate of return on investment is the interest rate used to estimate the present value of future benefit payments. Reducing the rate increases the estimated present value because more money must be set aside now to pay future benefits. This present value, known as the actuarial liability, is compared with the value of pension assets to determine the funded status of pension plans and therefore how much must be contributed by the employer to the fund. Public pension funds generally use the long-term assumed rate of investment return to discount liabilities for funding purposes. Read the previous blog post for more information about why the Trustees of the CTPF decided to make changes to the fund’s actuarial assumptions. The CTPF recently released the actuarial valuation report for its 2017 fiscal year that was prepared by the fund’s new actuary. The report states that the impact of all of the changes in assumptions on the fund’s actuarial liability was an increase of nearly $1.1 billion. The amount of actuarial liabilities not offset by accumulated assets, the unfunded actuarial liability (UAL), grew from $9.6 billion in FY2016 to $10.9 billion in FY2017, mainly due to the assumption changes. The actuarial funded ratio fell to 50.1% from 52.5% in FY2017. The CTPF is currently on a funding plan to reach 90% funded by 2059. The total employer contribution for FY2019, which starts on July 1, 2018, is projected at $808.6 million. Prior to 2017 CPS was alone among school districts in Illinois in being required to fund nearly all of the employer contribution to teachers’ pensions. Downstate and suburban districts had nearly all of their employer contributions covered by the State. However, 2017 legislation that created a new education funding formula for the State of Illinois also required the State to make the normal cost and retiree healthcare contribution for Chicago teachers’ pensions. The normal cost is the current-year pension cost. According to the FY2017 actuarial valuation for CTPF, in FY2019 the State will contribute its previously statutorily required $12.1 million plus an additional $226.8 million for the employer normal cost and retiree health contribution. CPS will be required to contribute the remaining $569.7 million. In addition to evaluating the CTPF’s actuarial assumptions, in its 2017 report the State Actuary prepared an analysis of CTPF’s funding adequacy, looking at supplemental measures that provide more context than the unfunded liability and funded ratio trends. The Federation found the State Actuary’s analysis of the adequacy of the CTPF’s statutorily required annual employer contribution to be particularly illuminating. 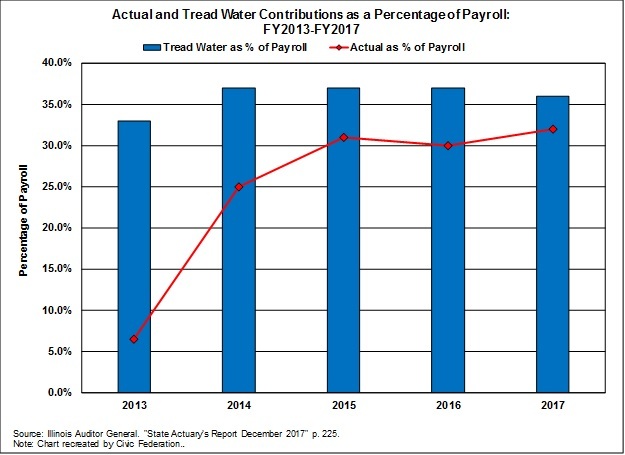 The analysis compares the CTPF’s current statutorily required contributions as a percentage of payroll to a “tread water” contribution. Comparing pension contributions to a government’s payroll provides a sense of the scale of the contribution. As noted above, the statutory contribution for CTPF is a funding schedule to achieve 90% funding by 2059. In contrast, the tread water contribution is an amount that would pay for the normal cost and the interest on the unfunded actuarial liability. If such a contribution were made by an employer, the unfunded liability would remain constant unless there were investment or other gains or losses. In other words, comparing the statutory contribution to the tread water contributions shows whether the statutory contribution is sufficient even to prevent the unfunded liability from growing. Both the State Actuary and the CTPF’s own actuary recommend that the current statutory funding formula for Chicago Teachers’ pensions be changed because it is insufficient. Both actuaries recommend a 100% funding goal and the Fund Actuary recommends an amortization period of 30 years or sooner.